Total time: 55:45. All Compositions by Gustafsson (STIM), Mockunas (KODA), Kanevicius (LATGAA), Gotesmanas (LATGAA) and Aleksa (LATGAA). This record has been made possible by generous support of UAB “Vanvita” and UAB “Garsu pasaulis”. Great thanks to them. NoBusiness Records NBCD 1, 2008, edition of 1000 cd’s. 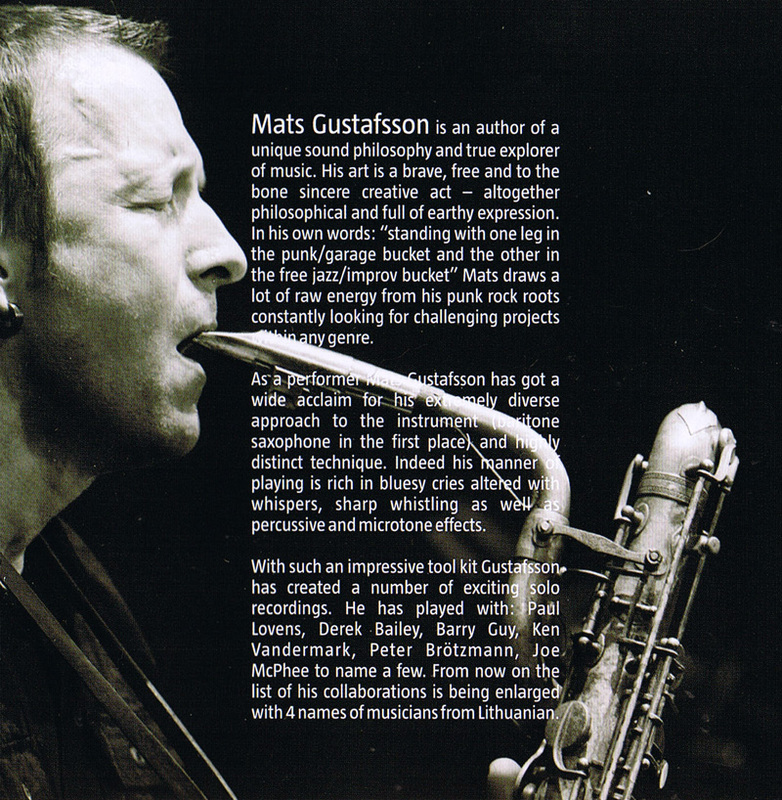 Mats Gustafsson is an author of a unique sound philosophy and true explorer of music. His art is a brave, free and to the bone sincere creative act – altogether philosophical and full of earthy expression. In his own words: “standing with one leg in the punk/garage bucket and the other in the free jazz/improv bucket” Mats draws a lot of raw energy from his punk rock roots constantly looking for challenging projects within any genre. 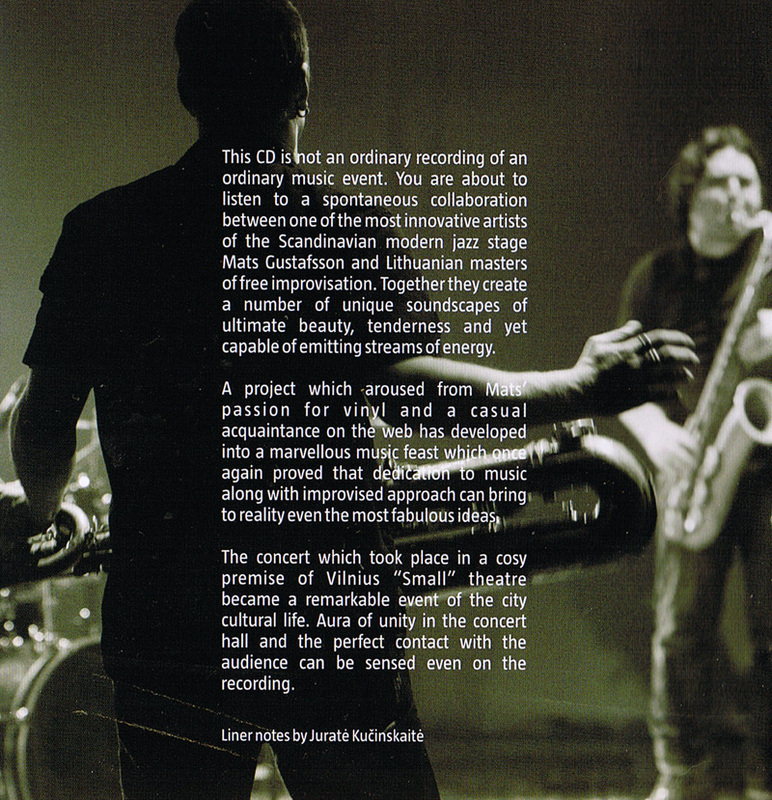 As a performer Mats Gustafsson has got a wide acclaim for his extremely diverse approach to the instrument (baritone saxophone in the first place) and highly distinct technique. Indeed his manner of playing is rich in bluesy cries altered with whispers, sharp whistling as well as percussive and microtone effects. With such an impressive tool kit Gustafsson has created a number of exciting solo recordings. He has played with: Paul Lovens, Derek Bailey, Barry Guy, Ken Vandermark, Peter Brotzmann, Joe McPhee to name a few. From now on the list of his collaborations is being enlarged with 4 names of musicians from Lithuanian. Devoting most of his time to performing with various international groups, Liudas Mockunas is hailed as an ambassador of Lithuanian jazz. He is a multi-reeds player and composer, whose name stands for masterly performance and intriguing compositions. His ‘natural’ idiom is an explosive mixture of free jazz, lyricism and expressionism combined with highly unconventional performance techniques. His in-depth exploration of the properties of sound and possibilities of harmonic series lead to an innovative and personal approach to wind playing techniques. This allowed him to escape from stylistic conventions and form an entirely original style, distinguished for multi phonics, expressive discharges of sound, over bends and unusual sound effects. 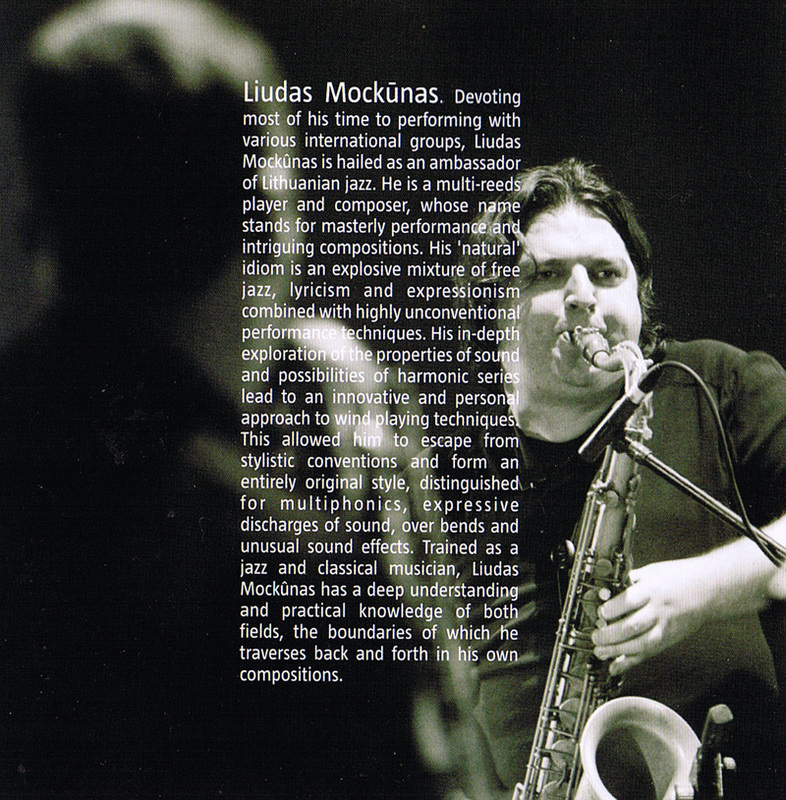 Trained as a jazz and classical musician, Liudas Mockunas has a deep understanding and practical knowledge of both fields, the boundaries of which he traverses back and forth in his own compositions. 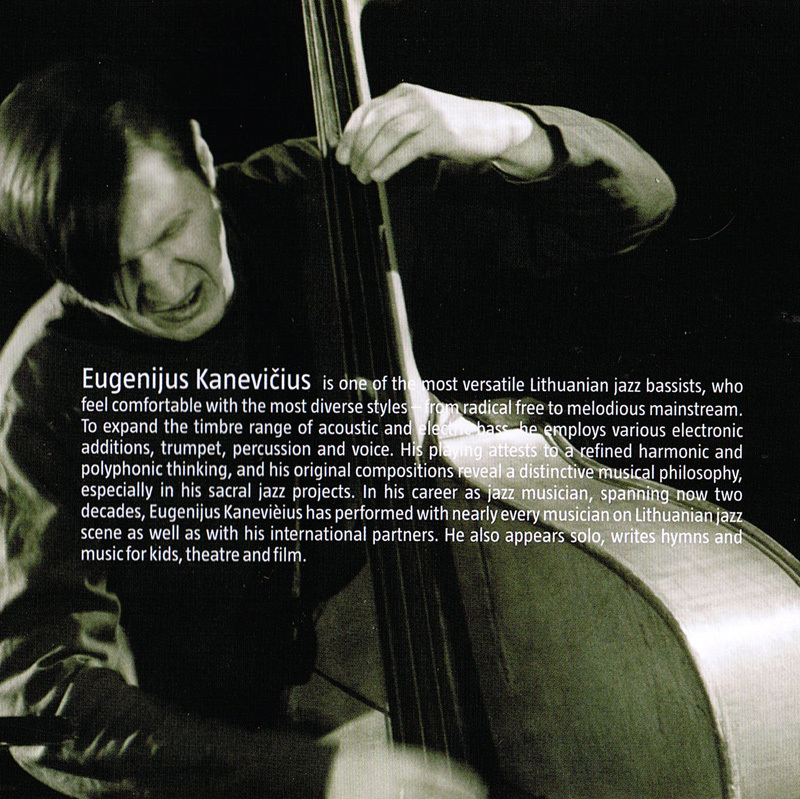 Eugenijus Kanevicius is one of the most versatile Lithuanian jazz bassists, who feel comfortable with the most diverse styles – from radical free to melodious mainstream. To expand the timbre range of acoustic and electric bass, he employs various electronic additions, trumpet, percussion and voice. His playing attests to a refined harmonic and polyphonic thinking, and his original compositions reveal a distinctive musical philosophy, especially in his sacral jazz projects. In his career as jazz musician, spanning now two decades, Eugenijus Kanevieius has performed with nearly every musician on Lithuanian jazz scene as well as with his international partners. He also appears solo, writes hymns and music for kids, theatre and film. 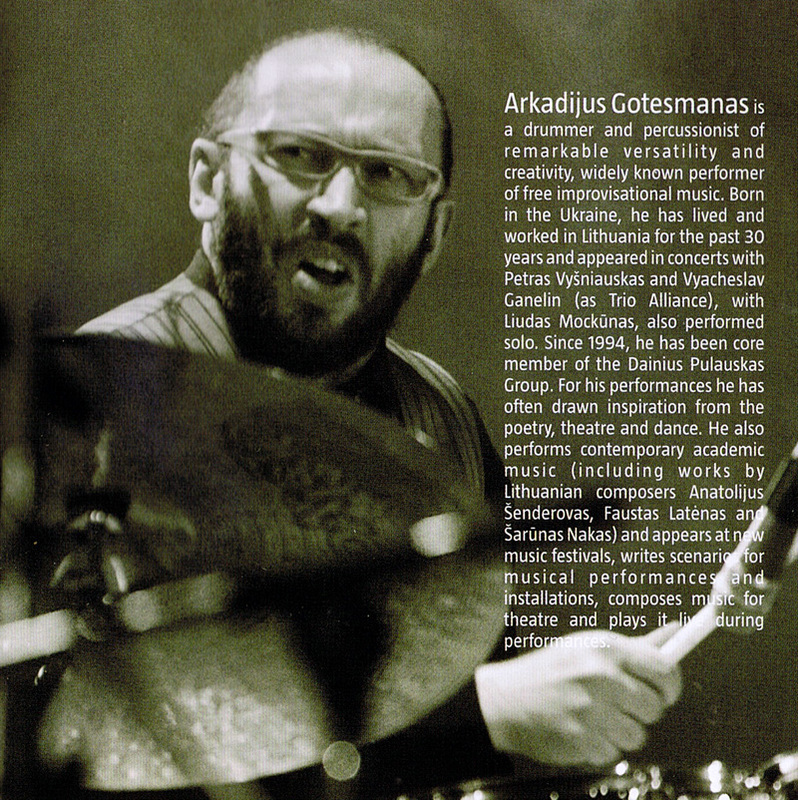 Arkadijus Gotesmanas is a drummer and percussionist of remarkable versatility and creativity, widely known performer of free improvisational music. Born in the Ukraine, he has lived and worked in Lithuania for the past 30 years and appeared in concerts with Petras Vysniauskas and Vyacheslav Ganelin (as Trio Alliance), with Liudas Mockunas, also performed solo. Since 1994, he has been core member of the Dainius Pulauskas Group. For his performances he has often drawn inspiration from the poetry, theatre and dance. He also performs contemporary academic music (including works by Lithuanian composers Anatolijus Senderovas, Faustas Latenas and Sarunas Nakas) and appears at new music festivals, writes scenarios for musical performances and installations, composes music for theatre and plays it live during performances. 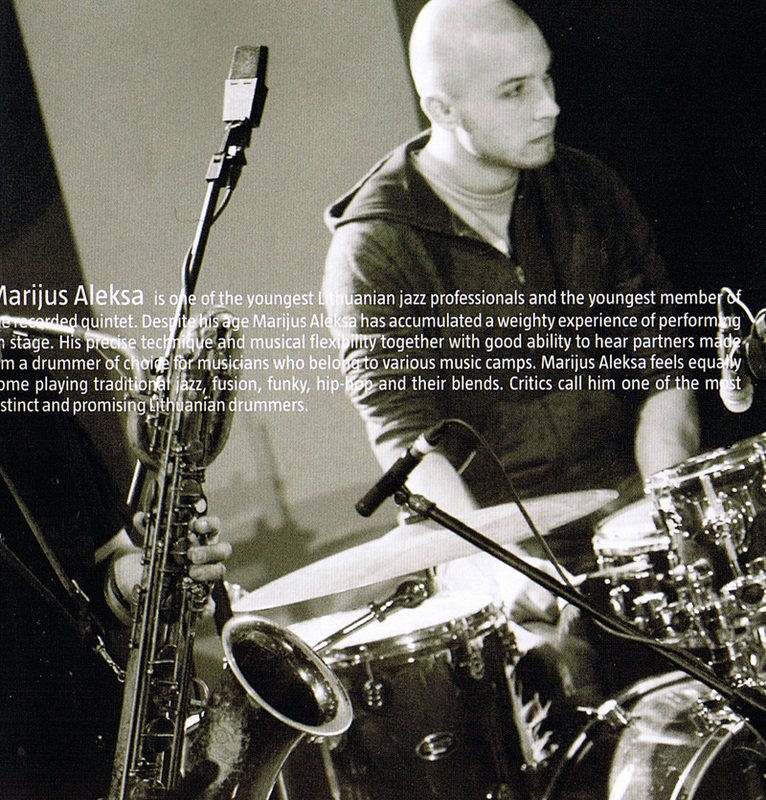 Marijus Aleksa is one of the youngest Lithuanian jazz professionals and the youngest member of the recorded quintet. Despite his age Marijus Aleksa has accumulated a weighty experience of performing on stage. His precise technique and musical flexibility together with good ability to hear partners made him a drummer of choice for musicians who belong to various music camps. Marijus Aleksa feels equally home playing traditional jazz, fusion, funky, hip-hop and their blends. Critics call him one of the most distinct and promising Lithuanian drummers.